Online registration is now closed. Registration will be available during packet pick up later today at (enter location) from 4:00PM-7:00PM. Registration will also be available on race morning from 6:30AM-8:00AM. Remember to bring your photo ID and USAT membership number when registering or picking up your packet. You MUST pick up YOUR OWN packet. NO EXCEPTIONS. The Go Girl Triathlon is Indianapolis' first ever women's only triathlon for both the experienced and beginner type. The distances are 500 meter swim, 10 mile bike and 3 mile run. Scenic Eagle Creek Park will host this event. The event is limited to 500 individuals and 50 teams. Event benefits The Julian Center. NOTICE - We are still accepting new entries at Packet Pick up on Friday or Saturday. Parking is available just inside of Eagle Creek Park. NOTE - If you do not download and print this parking pass, you will be required to pay a $5 entrance fee at the park. Age groups are as follows: 14-17, 18-20, 21-24, 25-29, 30-34...75+ There is also a Fat Tire division for those wishing to use mountain bikes (wheels must be a minimum of 1.5 inches and have upright handlebars) and an Athena division for those wishing to compete in the 165 pound and over division- note: if you are in the fat tire or athena division, you will not be eligible to compete in the age group division. There are 3 divisions for Triathlon Teams (2 or 3 people) and Duathlon Teams (2 people): All Male, All Female, and Co-ed. Relay teams compete in a relay format - one person swims/runs, then one person bikes, then one person runs. The top 3 in each division will receive awards - get a team and have some fun! All participants will receive a fitted, Tech-style tee! 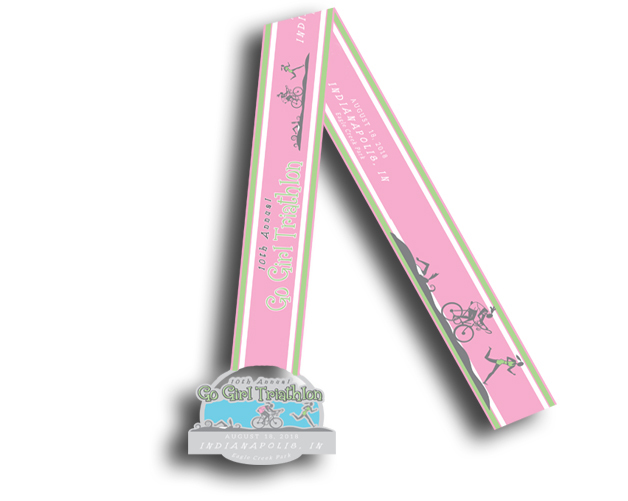 Finishers in the triathlon and duathlon will also receive this amazing finisher medal! The top 3 overall finishers will receive separate awards - The top finishers (minimum of 3) in each age category/division will also receive nice awards. Awards will be presented immediately after the event has completed. Get ready for the Go Girl Triathlon & Duathlon by training with the National Institute for Fitness and Sport in their 10-week summer program! This program is perfect for beginners all the way to seasoned veterans, and includes 3 different levels of training. Look forward to expert coaching, group sessions, free race entry, t-shirt, a snack after Tuesday training, and a special ladies night at Runners Forum! Cost - $160 for NIFS Members and $190 for guests. Save $15 and register between May 9 - May 30! ---If race has not sold out, participants will have the option to register at Packet Pick Up on Friday OR Saturday. Prices increase on Saturday, so be sure to pre-register! You can obtain final instructions and maps from the website: www.tuxbro.com/entry-info/GoGirl/GoGirl-CourseMaps.php beginning one week out from the event. We cannot make our events a great success without our WONDERFUL volunteers! Donate you time and help keep our athletes safe. We welcome individuals, groups, church groups, and organizations to join us! - Packet pick-up volunteers pass out bibs, timing tags, shirts, etc to participants. - Body Marking volunteers write the participants bib number on their arm to prepare them for competition. -Water Station volunteers pass out water and/or Gatorade to the participants on the course. Water Station volunteers will be at their designated water stop. -Transition volunteers assist within the transition area where the bikes and gear are placed. They help participants in locating their transition station, give directional assistance during the race, and secure the area. -Run Course Marshal volunteers give directional assistance to participants out on the run course. -Bike Course Marshal volunteers give directional assistance to participants out on the bike course. -Finish Line volunteers can help with one or more of the following duties, passing out water, removing timing tags, preparing refreshment tent for finishers. All volunteers receive an event t-shirt and have access to refreshments. We donate back to groups/organizations that volunteer with us for the day. When this page loaded, the official time was 8:55:12 PM EDT.